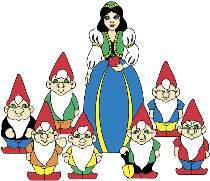 Snow White is one of the classic fairy tales originally collected in Germany by Jakob and Wilhelm Grimm, (the Brothers Grimm) in the 19th century. Snow White is 55"H. All projects can be cut from one 4ft. x 8ft. sheet of 1/2" plywood. When you order the huge blueprint you’ll get FULL SIZE drawings of all eight figures.